Closing the Book, essays proving the urgency of women being at the cultural table. Joelle Renstrom, like most of us in adulthood, has lost loved ones to death. Her father died of cancer at the disturbingly young age of sixty-three...her world then darkens bit by bit as more and more adult griefs mark her passage through time. Passing through time and space is a long-term interest of Renstrom's. Her blog, Could This Happen?, is dedicated to the topic of science intersecting with science fiction. Her ruminations on the near-miraculous reach of modern technology with the humdrum existence of thee and me are well worth your eyeblinks and earhairs. As one would expect of an MFA recipient, her ruminations are fueled by reading widely and voraciously. The methodology of her processing the pain of losing her dad is also, and unsurprisingly, based on the books she has read. My interview with the KMSU Weekly Reader about Closing the Book, travel, science fiction, and more! After [her dad’s] death, Renstrom finds herself “wandering aimlessly” through various locales and assorted books—through Sweden in the rain, carting around her father’s ashes, to an American grocery store, likewise soaked to the bone from some forest misadventures, dazed with loss and a little drunk on the rhythm and eye for consumerist creation of identity in Don DeLillo…. It is a savvy piece, raw and ironic at the same time, embodying something of the author it offers homage to, a sort of writing-with that, as a model for memoir, is sure to fascinate readers and writers and teachers of texts…. Whitman animates a whirlwind trip around northern Europe, Ishiguro and Camus both speak in their own voices (even to each other), Arthur Clarke offers metaphysical language for the transition on from mourning, and Kurt Vonnegut offers a frame through which life can be viewed as imitating art even as art speaks to the wildly harsh and unbelievable realities of life. "Her writing is gorgeous; her fine sentences elevate even the darkest subject matter." Evans also asked amazing questions in the author interview. Reading Joelle Renstrom's CLOSING THE BOOK: TRAVELS IN LIFE, LOSS, AND LITERATURE is like having a conversation with a best friend, one who totally gets me, after a long absence. Renstrom's essays present a person unsettled by loss and floundering in the aftermath, but she writes them so gracefully that the floundering feels more like dancing... As she makes her way toward closing the book, I am already looking forward to opening it again. "The authors and books she incorporates into her search for meaning are sometimes the centerpiece, the driving force of the essay, but other times they are part of the background. The essays don’t become homogenous, which would have been an easy pitfall for such a focused endeavor. Renstrom’s prose is smooth and lively and, despite the somber nature of her subject, I found myself rapidly reading through these essays." "This is the most beautiful book I have ever read. It’s at once a memoir, an ode to favorite literature, a glimpse into teaching – and writing. Joelle Renstrom’s new book, Closing the book: Travels in Life, Loss, and Literature, is a work of art. " Read the rest of the review and the author interview. Closing the Book is a Small Press Distributor handpicked title and a New Pages Editor Pick. 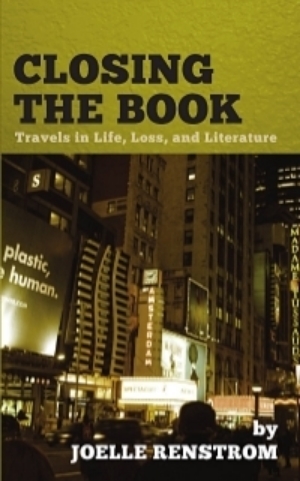 Joelle Renstrom's collection of essays, Closing the Book: Travels in Life, Loss, and Literature, was published by Pelekinesis in August, 2015.